In an opinion filed on January 15, 2019, the Eighth Circuit Court of Appeals upheld the district court’s ruling that UnitedHealth Group’s practice of recovering overpayments made to “out-of-network” providers from one plan by taking an offset for the overpayment from a different plan – a practice known as cross-plan offsetting – was unreasonable. See, Peterson v. UnitedHealth Group, 2019 U.S. App. LEXIS 1270 (8th Cir. Jan. 15, 2019). United administers thousands of health insurance plans, processing millions of claims. At times, an error results in an overpayment. Generally, agreements with “in-network” providers allow it to offset any such overpayments by withholding the overpaid amount from subsequent payments to that “in-network” provider. In contrast, such agreements do not exist with “out-of-network” providers. Nonetheless, United implemented an aggregate payment and recovery procedure in 2007 whereby it would recoup overpayments to “out-of-network” providers by cross-plan offsetting. The plaintiffs – “out-of-network” providers who United intentionally failed to fully pay for services rendered to plan beneficiaries in order to offset overpayments to the same providers from other United-administered plans – challenged that practice. 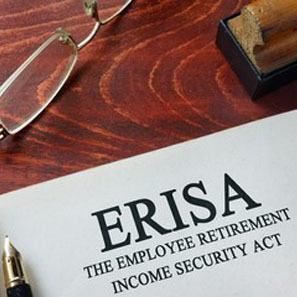 Litigated under the Employee Retirement Income Security Act of 1974 (ERISA), the plaintiffs argued that the relevant ERISA plan documents do not authorize United to engage in cross-plan offsetting. On the merits, the district court had agreed. The court reviewed the underlying plan documents and concluded that of those plans that did address offsetting, “all of those plans explicitly authorize same-plan offsetting; and not one of those plans explicitly authorizes cross-plan offsetting.” The district court held that United’s interpretation of the plan documents to allow cross-plan offsetting was faulty and not reasonable; an immediate appeal was certified. The circuit court was apprised in an amicus brief filed by the Secretary of the Department of Labor that the Department had issued two Advisory Opinions supportive of the district court’s conclusion that United’s cross-plan offsetting is prohibited by ERISA. See, AO 77-34 and AO 81-62A. It also critiqued United for its citation to inapposite authorities, one from the Fifth Circuit, which did not decide or even consider whether the practice of cross-plan offsetting violates ERISA, and another from the Eighth Circuit which permitted same plan offsets with respect to same participants, but did not extend to cross-plan offsets for different participants. The Secretary urged that United’s plan interpretations were unreasonable and its subject cross-plan offset practice violative of ERISA, and the court agreed. After initially determining that the plaintiff, Dr. Peterson, had standing to bring the action as a representative of his patients, the circuit court addressed United’s argument that the grant of broad administrative authority in each of the many different plans was sufficient to enable it to cross-plan offset. Observing that where an ERISA plan grants the administrator discretion to interpret plan terms courts generally apply a deferential abuse-of-discretion standard of review, the court focused upon two key points in its analysis under ERISA in finding United’s interpretation as to cross-plan offsetting unreasonable. First, nothing in the plan documents came close to authorizing cross-plan offsetting. The court held that to adopt United’s argument, that plan language granting it broad, generic authority to administer the plan is sufficient to authorize it to cross-plan offset, would be akin to adopting a rule that anything not forbidden by the plan is permissible under the plan. Such an approach, it ruled, would undermine plan participants’ and beneficiaries’ ability to rely on plan documents in knowing what authority administrators do and do not have, contrary to ERISA’s requirement that “[e]very employee benefit plan shall be established and maintained pursuant to a written instrument.” 29 U.S.C. § 1102(a)(1). Second, the court found that the practice of cross-plan offsetting is in some tension with the requirements of ERISA, approaching the line of what is permissible. “If such a practice was authorized by the plan documents, we would expect much clearer language to that effect.” An ERISA fiduciary must act in accordance with the plan documents, act prudently and “discharge his duties with respect to a plan solely in the interest of the participants and beneficiaries and … for the exclusive purpose of … providing benefits to participants and their beneficiaries; and … defraying reasonable expenses of administering the plan.” 29 U.S.C. § 1104(a)(1) (emphasis added). Each ERISA plan is a separate entity and a fiduciary’s duties run separately to each plan. The court found that cross-plan offsetting is in tension with such fiduciary duty because it arguably amounts to failing to pay a benefit owed to a beneficiary under one plan in order to recover money for the benefit of another plan—a benefit to the latter may not necessarily benefit the former. The court also noted that the subject procedure might also constitute a transfer of money from one plan to another in violation of ERISA’s “exclusive purpose” requirement. 29 U.S.C. § 1104(a)(1). Concluding that United’s interpretation of plan documents permitting it to cross-plan offset is unreasonable, the court affirmed the district court’s grant of partial summary judgment to the plaintiffs. If you have any questions or would like more information, please contact Elizabeth A. Venditta (vendittae@whiteandwilliams.com; 215-864-6392).